Have you heard of 20×200? It’s a site which supports artists and provides affordable art in limited editions. I’ve already made one purchase and it won’t be my last! 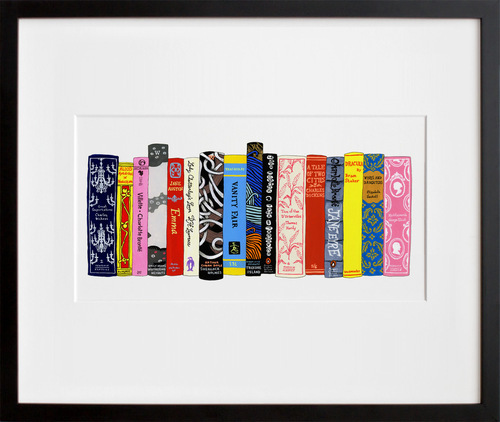 Check out artist Jane Mount’s “English Lit,” which is the artist’s rendition of a bookshelf consisting of classic English literature including works by Charles Dickens, Jane Austen and Charlotte Bronte. Posted on 27, February 2012, in Books, Design and tagged 20x200, art, English Lit, Jane Mount. Bookmark the permalink. 1 Comment. At the prices they sell work at, it’s not going to be supporting any artists, just the site. Sorry. I sell on Redbubble and just about make some money, but they still take quite a whack.